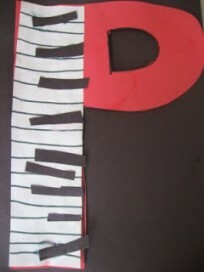 A lot of young kids do not like masks, they are frightened by them, so this is a fun alternative. 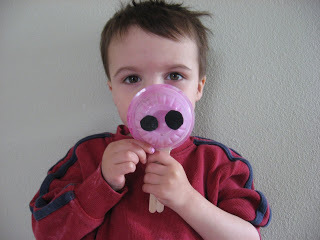 By making just a snout you can still enjoy the dramatic play a mask encourages but without any fear. We’ve been playing with it all afternoon acting out the story of the 3 little pigs . Gather your materials. 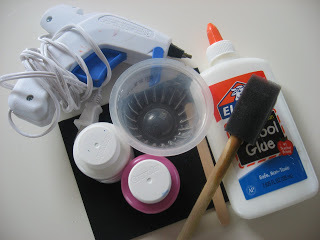 You will need a washed out clear food container, some black foam, white and red paint, a paintbrush, 2 popsicle sticks ( or a tongue depressor would be awesome), scissors, glue and a hot glue gun. 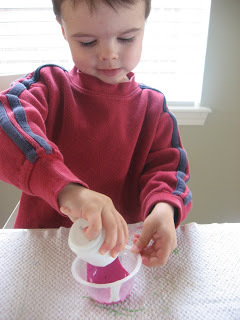 Start by pouring a small amount of white and red paint into the container. 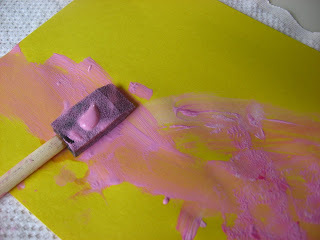 I like doing this instead of pink to help teach color mixing in an authentic way. 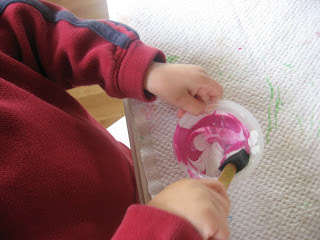 We painted a scrap piece of paper with the extra paint while we waited for the cup to dry. 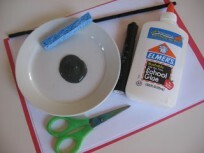 Cut out 2 small circles from black foam or paper. Glue them on the bottom of the container. Let dry. 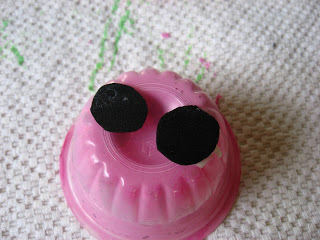 * you can glue these on before the pink is all dry and just set the cup “nose down” on a plate. 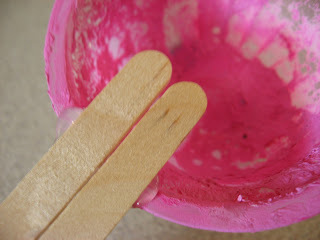 Glue the popsicle sticks on. Let cool. I decided on 3 different copies of the tale of the 3 little pigs! “The Three Horrid Little Pigs” by Liz Pichon was a great read! My son loved that the wolf wasn’t big or bad in this version of the story and seemed to enjoy that the pigs were so rude and horrid! Of course there is always a good ending to this story and this one was the best! No one gets eaten in this book, the wolf is a friendly builder and the lazy pigs learn their lesson. The illustrations are bright, fun and my son loved them. Check this one out for sure. “The 3 Little Pigs” illustrated by Marie-Louise Gay is a classic telling of this story. I am not really a fan of the story itself , the wolf has always really disturbed me the way he pursues this pig! But that’s my adult take on it, not a kid’s! My son loved it, he even smiled at me as he pointed out the fact that the wolf was scary, he didn’t get that from me! The illustrations in this book were really fun and I loved the details she put into them. 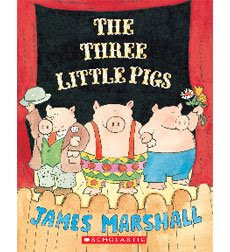 ” The Three Little Pigs” by James Marshall who you may know from the wonderful George and Martha series. This another classic version and the illustrations are adorable! I love the three pig’s houses in this book, all three make cute houses even if only one survives the big bad wolf. Like the previous book the pigs and wolf do get eaten so if you are weary of that stick to the first book! a must add to the ‘to do’ list! Maddie loves pretending to be different animals. I’ll have to use with my girls. hahaha i love it!! your son is a cuuuuute pig!! So cute! 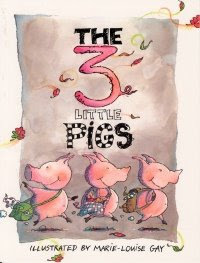 Have you checked out the “True Story of the Three Little Pigs”? Another favrite pig-themed book of ours if “Pigsty” by Mark Teague. Whenever the house is a mess I joke that the pigs will be moving in soon. It always gets a good giggle. The true story of the three little pigs is awesome- I think I need to do a pig themed book list! Pigsty is great too – I reviewed it last year and then bought it! 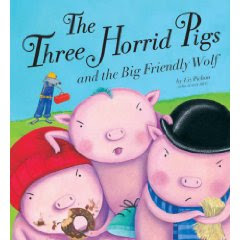 Another book is The True Story of the 3 Littke Pigs by A Wolf great book from the wolf’s point of view! Very cute! 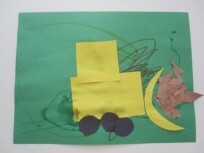 We did this project yesterday…my DD is 27 mos…she really only painted the cup, but she’s been “oinking”!! haha! Yeah that’s why I like doing the color mixing , get a lesson in in case the rest gets done by us! We were oinking today too! hi! I’m interested in that â€œThe 3 Little Pigsâ€ illustrated by Marie-Louise Gay. Are there any scary illustrations inside? what about “the nose” and a rhyme?